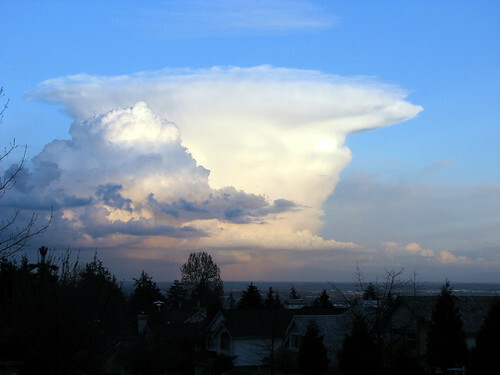 This one kind of cloud has the characteristics of a towering cumulonimbus, with the vertical growth and anvil-shaped head; however, this one had wind sheer all around the crown. Wow – great shot ! That looks unreal! Great shot! Now that’s a picture I need on my wall! Wow, that is just amazing. Gorgeous photo, and believe it or no these types of clouds are often mistaken for UFOs?! Happy WW! That is a very impressive cloud and picture! Very nicely done! Very impressive and powerful-looking. Did it deliver a wallop? Very impressive cloud. Happy WW! Happy WW! Love this cloud…seems you know a lot about them. You might also like my blog with lots of clouds called Maui Skies. Wow! That is amazing! Beautiful! Awesome..I could look at that sky for hours! If you get bored, check out the Scavenger Hunt over at Amys Random Thoughts! New prizes were added today! It’s beautiful. OTOH, I “see” things that my dh calls “Toni’s world.” Today in Toni’s world I see upside down Peanuts feet (Schultz’ Peanuts). Very beautiful. I love to watch clouds – as long as they don’t bring storms with them. That took my breath away! What a beautiful photo. I love it when I have my camera on hand for things such as this! Sounds like you know your clouds!!!!!!!!!!!!!!!!!!!! !